Running a marathon was always one of those ‘Someday I want to . . . ‘ things, but it seemed far beyond reach. Then at age 33, and with no running background whatsoever, I stumbled upon a Chicago Marathon application in a business lunchroom. It said: finish in 5 1/2 hours, get a finisher’s medal. Ignoring any sense of logic, I thought: how hard can 5 1/2 hours be? Never mind that I had never really tried to run. Before I could talk myself out of the impulse, I filled out the application, wrote a check, dropped the envelope in the mail. Then I told my wife. She thought I was insane. Ten weeks later, with several 9-mile runs and a by-the-book -- though pretty terrible and discouraging -- long run of 20 miles under my belt, I was standing at the starting line of the Chicago Marathon, grinning but not really knowing what I was in for. I decided I’d just keep moving forward. To this day, that’s the most important lesson I’ve learned: keep moving forward. 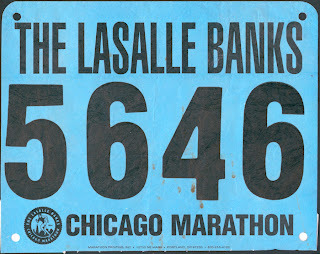 I’ve run Chicago twelve times, and I can tell you, from the first one on October 30, 1994 to the last, there’s almost no marathon as exciting and fun as Chicago. you might expect in your first marathon. The first and last thing to keep in mind is -- whether it's Chicago or another marathon -- it's a journey. And the point of the journey is not just about arriving at the end, it's about everything that happens along the way. Embrace it, draw from it, endure it and own it: the spirit of the marathon. Enjoy the pre-race expo, it’s the appetizer to the event. There’s an incredible buzz of excitement, thousands of runners picking up their race numbers, all of them anticipating a great day. Walk every aisle. Sample stuff; talk to exhibitors, soak it in. Worried about what time to arrive in the vicinity of the starting area on race morning? Keep it simple: whatever time you think is an adequate arrival time, you'll be happier to be there 30 minutes earlier. About 45 minutes before race time, start walking toward the line. If it’s cold, put on a large black Hefty garbage bag (poke holes for arms and head) and it’ll keep you warm. You will not look silly; many others will do the same. Just before the start, you can discard the bag. With more than 35,000 runners, you will be surrounded by people from start to finish. These are your new friends for the day. You will all be bonded by a common goal and purpose — getting to the finish line. Get to know them. In the start area, look to your left, right, front, back, shake each person’s hand, tell them it’s a great day, wish them luck. Smile. Congratulate yourself a little. You're at the start of something great. Something that you once thought was impossible. Really impossible. But you're there, ready to make the impossible possible. Good for you. The start of the race is an experience like no other. 35,000 people will move forward almost as one; picture everyone in Wrigley Field all running down Addison; that’s what this is. Smile as you shuffle across the start line. Don’t get impatient if you can’t start running right away, enjoy those walking steps as the field slowly begins to find room to run. As you run under overpasses in the next two miles, smile and wave at the hundreds of people looking down. Draw on their smiles and excitement. Spectators will line the road, very thick at times, for most of the first 13 miles. Smile and wave when you can. There will be water stations every mile. I’d stop at every other one. You don’t need to drink heavily, a half cup will be fine. Later in the race, if you need more, take it. To each person who hands you a cup, say: thank you for being here! From LaSalle St (mile 2) through Lincoln Park Zoo (mile 5), to Addison/Broadway and Clark (mile 8-9), and back north to Wacker (mile 12) take in the sights of Chicago all around you. What a fabulous tour! Reaching Wacker Drive, you will not recognize it, for all the spectators on either side. Knowing they are there is what helps literally pull me to the loop for miles 9 to 12. They say: you look great, you’re doing great, you’re almost halfway there!! You couldn’t agree more. Smile, enjoy, be proud of yourself. Then it does get different. Heading West past mile 13 on Adams, things thin out a lot. The spectators aren’t there, you’re heading away from Chicago, you still have half way to go. If the crowd and the excitement carried you the first 13 miles, your legs will do more of the work on the teen miles. Don’t worry about where you are in the race, don’t ask: are we there yet? Because you’re not, and won’t be for some time. Not that that’s such a bad thing. I tell people that there’s no vacation as pure as a marathon or an Ironman triathlon. Rare is the opportunity to be completely isolated, alone with your thoughts, yet in company of others in pursuit of the same goal. This is where a favorite saying of mine kicks in — the point of the journey is not to arrive; anything can happen. And at this point in the race, things will happen. Thoughts will come to you that you’ll retain for years. What may seem like an ordinary left turn from Adams onto Damen at mile 15 might be your most lasting memory of this event years from now. It may be the time at which you discovered something great about yourself, the time at which you found renewed strength, the time you thought all was lost, anything. But you will keep moving forward. Continue to draw energy from the people around you. By now, you’ll actually recognize people who’ve been with/near you for miles. Talk to them, have fun with them. How you feel, they feel. You have company. You may be getting sore. In more places than one. I like to say that if you run long enough, you’ll get to the point where everything hurts louder than everything else. Then you keep moving forward. If you need to walk, walk. There will be people who walk every step of the day. You’re all headed the same direction. No problem. You also may be thinking, where are we going? Thankfully, you’re heading for some fun. I like to look forward to things, things to keep me going, and one of those is Chinatown at mile 21. Crowds fill up again, there’s the giant dragon, a TV camera or two, and when you make that right turn through Chinatown, prepare to smile for the camera! There’s always a race photographer waiting for you there. The next thing to look forward to on your trip south is passing by White Sox Park. You will run a mile or two then see it in a distance. I remember seeing Oprah in 1994 at the side of the road, cheering people on. To this day, I still look for Oprah there. You can too. If she’s not there, look forward to the rock band playing in the shade of the ballpark by the water station. Walk through this station, drink 2 cups of Gatorade, momentarily enjoy the music, then move on. Less than 4 miles to go. To be honest, the next 3 miles aren’t the easiest. Not that they’re any harder than the previous ones, but it’s where they are in the race. I must confess, I was walking non-stop by this point in my first one. Even now, when I’m running pretty fast at this point, it’s not easy. But this situation is alleviated by one thought: it will be over SOON. Keep moving forward, you’re getting closer. And as you get closer, a great landmark will get bigger. The Sears Tower becomes your beacon; each step closer towards it is a step closer to your own personal victory. You are almost there. You are almost a marathon finisher. Keep going! Savor the final turns, from Michigan Ave right onto Roosevelt Rd then left onto Columbus Drive. On Columbus Drive, all of a sudden the road opens wide. After all those miles where you were so close to other runners, all of a sudden you’re out in the open, seemingly alone. And you see the finish line a few hundred yards ahead. It can be the most wonderful sight. You’ll never forget it. At that moment, you can choose how you want it to end. You can run straight ahead; you can veer over to the side and high-five spectators; you can look for families and friends who might be there. Just don’t forget to make it to the line, sometime. When you do cross the line, SMILE. You’ve done it! And photographers will take your picture to prove you finished; better to look good! You can learn more about yourself in 26.2 miles than you have in years. There will be moments when you don’t feel well, there will be moments you feel elated. There will be moments when you realize that you’ve gotten through something you never thought you could get through, and those are the best moments of all. You can live a lifetime out there, but it will be over in the blink of an eye. The point of the journey is not to arrive; anything can happen. And it will. You will finish, you be able to celebrate an achievement like no other. Spectator notes: if friends/family do want to come see you, it helps to have a rough idea when you might see them. A system that worked for my family was to meet me on Adams as the race headed west (about mile 13), then they’d go to the Palmer House for hot chocolate and to read the paper, heading to the finish line a little before my projected time. They loved this plan, and I loved seeing them. My rule: if I saw them, I’d always stop for a kiss and a hug. My wife and kids have never forgotten those moments, neither have I. Expectations notes: Know that someone will finish the race in more than 7 hours. Someone else will finish it in closer to 2 hours. In between, 34,998 others will finish, and you’ll be one of them. Do not worry how fast you finish. Do the best you can, in the moment, and that’s the best you can do. And that, in and of itself, is victory.